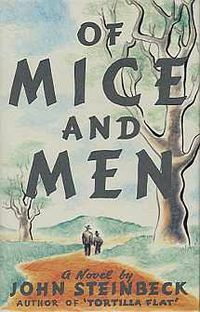 As part of their Junior Cert English course, Ms Keena's 3rd year class prepared alternative covers for their novel, 'Of Mice and Men' by John Steinbeck. Two students who produced fantastic front covers were Emily Verhulst and Martina O'Neill. Above is a front cover that was published but to see the girls' work please click on the link below! Well done girls on a great job!